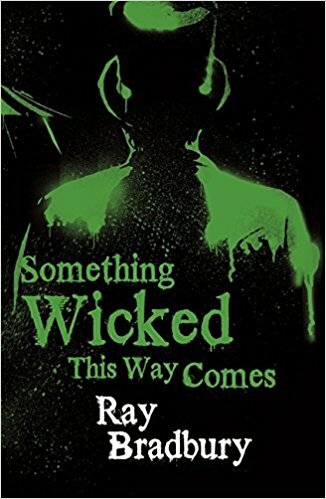 Something Wicked This Way Comes is a Ray Bradbury novel set in the small town of Green Town Illinois where two boys, Will Halloway and Jim Nightshade, live next door to each other and are best friends. Will and Jim have a lot more in common than just living side by side on the same street. The two boys were born within just a couple of minutes of each other, but a day apart. Will was born at one minute before midnight on October thirtieth and Jim was born one minute after midnight, which made it October thirty-first. The boys are very proud of this fact and the first chapter of the book finds them sharing the story with a lightning rod salesman who has turned up in town, just ahead of the storm and is convinced that one the boy’s homes will be struck by lightning. This might sound like a sales tactic, but it is obvious that the salesman believes his spiel because when he hears that neither of the boys has any money and their parents are not home, he gives Jim a lightning rod for free, after a closer inspection reveals that Jim’s house is the one on the lightning’s hit-list. When the lightning rod salesman passes through Green Town the date is October twenty-third, but during the early hours of October twenty-fourth something far more dangerous than lightning arrives in town—something wicked. Lightning can destroy the body, but Cooger and Dark’s Pandemonium Shadow Show brings with it an evil that can endanger the soul. Someone else is also awake when the carnival arrives, but he is nowhere near Rolf’s Moon Meadow. Will’s father, Charles, is working alone in the library. He’s the caretaker, but it is not unusual for him to be amongst the books in the middle of the night. Charles does not sleep well and often sneaks back to work when he believes his wife and son are asleep. Charles is a lot older than his wife and was past his prime when Will was born. Charles may be an old man, but he is probably not as old as he feels and that’s his weakness. It is this weakness that the carnival later tries to use against him. Fortunately. Charles also has a lot of strengths. One of them is his mind. He is a thinking man and there is an awful lot more to him than meets the eye. There is a lot more to Mr Dark than meets the eye as well. Mr Dark is not just the co-owner of Cooger and Dark’s; he is also one the star attractions. Dark is The Illustrated Man and beneath all of that tattooed skin lives an evil that has walked the centuries. Something Wicked This Way Comes was first published in 1962. It is based on a short story Ray Bradbury had written many years earlier called “The Black Ferris”. The story had never been published and he later used it for the basis of a screenplay he hoped Gene Kelly might be interested in. Kelly was more than interested, he loved it and wanted to direct and produce it. Unfortunately, Kelly could not find the money to do so and had to pass on the project. With his screenplay dead in the water, Bradbury spent five years re-working it as a novel. And what a novel it is! Something Wicked This Way Comes is a great book. There is a real magic to the story and Bradbury has also managed to capture the feeling of what it is like to be a young boy. Jim and Will, are very believable characters. They are also very different. Jim is a lot more impulsive than Will; so Will always has to prevent his friend from getting into too much trouble. I liked all of the characters in Something Wicked This Way Comes, even the evil ones like The Dust Witch (wouldn’t want to get on the wrong side of her), but there is a lot more to this tale than just the characters. If you should decide to read Something Wicked you will read about a mirror maze that reveals much more than a distorted reflection and there’s a carousel that offers something very tempting indeed. Ride it one way and you get older. Ride it the other way and the aging process is thrown into reverse along with the gears. But everything has its price and sometimes even a free ride can cost you dearly.